Do you wish to revive the good look of your windows quickly and efficiently?Are you scanning for techniques of effective window cleaning? If so, you have come to the right spot! With the professionals of window cleaning in South Kensington, you will positively bring back the daylight into your home. You will enjoy spotless glass surfaces as well as perfectly clean frames and sills. You will be able to use your recently-acquired leisure time as you want to while we shine the glass surfaces of your home. You will not only escape from this tedious and demanding work – our services will also give you some delightful benefits. We also provide our professional services in nearby areas: North Kensington, Battersea, Kensington, Chelsea, Belgravia. Improve the look of your property – the specialists of commercial window cleaning will take care of that. As part of our distinctive technique, we use water-fed extension poles. With this approach, we can clean entirely the exterior of your workplace, up to the fourth floor. In order to reach higher windows we use rope access. We make sure your windows will look pristine, regardless the high of the building. With the help of the squad of specialists London's skyline is never going to be dusty. We provide first class window cleaning by using advanced methods. We provide perfect and pristine look for your glass surfaces, skylights and greenhouses with water-fed cleaning system and jet washing. The poles we use are connected to water supply in our vans, thus eliminating the risk of damage to the exterior of your home or workplace. What's more, we use entirely safe rope access methods to clean glasses on tall buildings. You can take advantage of these techniques instantly – phone us on 020 3746 3113! With our know-how and technical excellence, you can rely on us for residential and business window cleaning. Your property will look pristine after our service, it doesn't matter what kind of windows you have. We polish and wipe single, French doors, sash or double windows, bay windows and patio doors. Moreover, we clean garden windows, skylights and conservatories. In other words, you can depend on us for thorough cleaning of your windows, including the framework and sills. The experts of window cleaning in South Kensington will revive your dwelling. 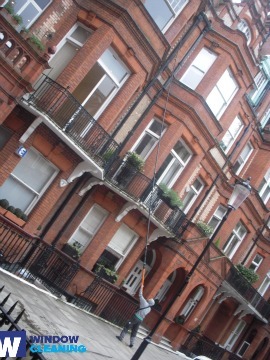 We provide the best window cleaning services in South Kensington. Our practice includes water fed extension pole system and also jet washing. We guard your health and safety with eco-friendly solvents and purified water. Be one of our satisfied purchasers – dial 020 3746 3113 and get in touch with our customer support centre. You can also request our services on-site – just fill in our booking form or use our chat feature. The nearest tube station serving SW7 South Kensington is Sloane Square.